With how much my husband and I travel, it isn’t too surprising that we depend on reusable cups. As we are traveling we fill our travel mugs with coffee, water, soda, or just about anything we want to drink. The problem we have with most of these cups, however, is that they are prone to messes and don’t keep hot beverages hot for very long. 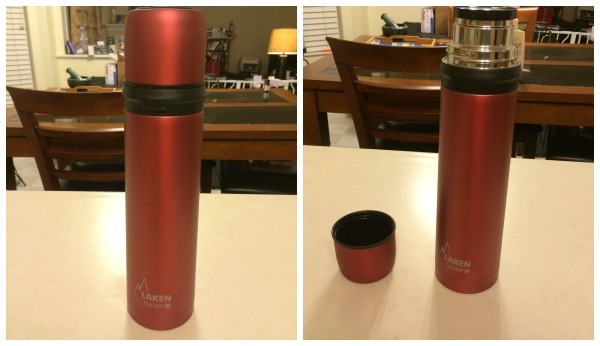 As I was throwing away our old, unusable mugs, I was approached by Laken USA – who asked us to review two of their awesome flasks and one of their stainless steel thermo cups. Right before we left on our business trip to New Jersey we grabbed our Laken products, excited to see how they worked during our 14 hour trip! Looking for high quality bottles, canteens, flasks, food containers, cookware or travel mugs? If so, we think you will love Laken USA. Founded in 1912, this well known European company has been making BPA and toxin free products for decades in Europe, and are finally bringing their popular products to the United States. Not only are their products quality, but fairly inexpensive, letting you have eco-friendly products without the price! To learn more, make sure to watch the video below or visit their About Us page! The first products that we used was during our trip was the Laken 17 oz Insulated Stainless Steel Thermo Cup. Unlike many other stainless steel cups, it is made from 18/8 food grade stainless steel and is free of Bisphinol A, phthalates, lead or other harmful substances. As well, it is designed to keep beverages hot for up to 7 hours, making it a great choice for travelers like us! For us, the Laken Stainless Steel Thermo worked very well, allowing us to drink coffee throughout the first part of our trip. From what we saw, it kept our coffee hot while it lasted, but we obviously didn’t let our beverage sit for hours, especially when we were driving for so long. With it’s no slip base and handle it was also mess free. So far, based on our own experience, we give the Laken 17 oz Insulated Stainless Steel Thermo Cup an A rating. Out of all the product I received from Laken, the 17oz Vacuum Insulated Stainless Steel Thermos Flask w/Neoprene Txikoriabelar was my absolute favorite. As someone who loves ladybugs, how could you not love its cute pink cover? Not only does the cover look cute, but makes your flask easier to carry and can keep your beverage hot or cold for up to 18 hours! The stainless steel flask inside is also free of Bisphinol A, phthalates, lead or other harmful substances. I really can’t think of anything I don’t like about this cute flask. So far, I am happy to give this product an A rating. 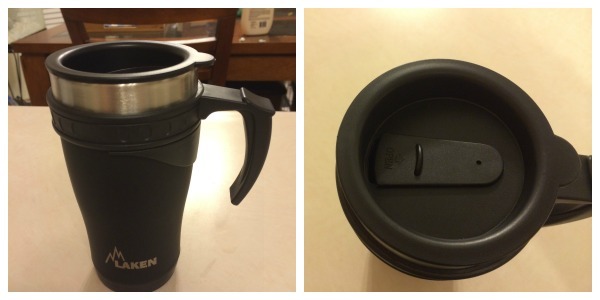 During our trip, we used the Laken Thermo Vacuum Insulated Stainless Steel Flask the most. This flask is able to keep beverages hot for up to 18 hours and is textured in a way to make it easier to hold while you drive or work. Like their other flasks, it is free of Bisphinol A, phthalates, lead or other harmful substances. So far, it has been a great product for us, giving it a Budget Earth A rating! Want to purchase one of these amazing flasks or travel cups for yourself? You can purchase all the products featured in this review on the Laken USA website! I can’t wait to try one of these products. I use travel mugs and a thermos. I have found that the coffee gets cold too soon and the ice water gets warm to quickly with other products. I hope that doesn’t happen with these. I havent heard of this company yet and they look to be a good quality product. I hadn’t before been aware of the Laken Company and their products. I’m happy to know they have been in business since 1912. This tells me how long they have been perfecting their products. I love that the flasks are vacuum packed and made from stainless steel as well. I love the design of all the mugs and flasks shown. I love that the travel mug, even though its stainless steel, has a plastic lid. For some reason the stainless steel to actually take sips out of really bothers me and I can’t drink out of them. First of all, I appreciate that these are BPA, eco-friendly products. And I also love that they come in many different colors & patterns. If I had to choose only one, it would have to be Laken’s Thermo Vacuum Insulated Stainless Steel Flask, which would really come in handy when I attend Christian conventions and assemblies. I’m with you. I just can’t find an insulated mug that keeps contents warm much less hot. I would love to have the Vacuum Insulated Stainless Steel Thermos Flask too and the cover is just too cute. I have been drinking a lot more water and trying different reusable bottles. I like a large bottle and the Laken Classic Thermo Vacuum Insulated Stainless Steel Water Bottle looks just like what I need. I love that you can fill it with hot or cold and the outside of the contatiner won’t change temperature and will not have condensation build-up on the outside. Thanks for the review. I have a large collection of travel mugs and thermos bottles. My biggest complaint about the travel mugs I have is the fact they don’t fit well in the cup holders we have in our car. I would really appreciate finding a better travel mug that fits, as well as keeping my coffee hot during commuting. I like that the Laken products are stainless steel and free from harmful substances. The Thermos Vaccum Steel Flask sounds perfect for travelling or work as it keeps your beverages warm for 18 hours. I have an obsession with mugs and bottle type things, I have waaaay too many, lol. I love the look of these travel products! Thanks for the introduction to this line, I had not heard of them and they are awesome ! I hope to win and try it out for myself…. but if not I will be getting one for sure! Good Luck To All!!! I have gone through a lot of flasks in the past few years. Either they don’t keep the heat or keep breaking. Maybe my search for the perfect flask is over! 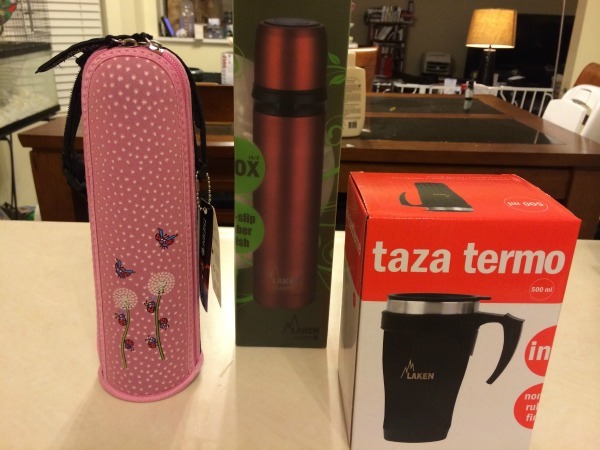 These Laken USA flasks and mugs appear to be very nice and I like that you point out that they keep your drinks the right temperature, I hate to get a travel mug and it gets cool real fast and I hat the ones that dribble when you try to drink out of them, there is nothing worse than taking a drink from a travel mug and have it dribble on your clothes, I think that the Laken Thermo Vacuum Insulated Stainless Steel Flask would be perfect to carry water to work in on a daily basis. I have been looking for travel containers for taking food and drink from home and to the teachers lounge! These products look perfect! Thanks for the review! Oh bpa free is great. I like the travel mug! I never heard of this company before, but the products certainly look well made, and attractive, too. The Laken Classic Thermo Vacuum Insulated Stainless Steel Water Bottle looks like it would be perfect for me! Thanks for sharing this great review – I have not heard of this brand before! Their designs are cute and I like that they also have covers for the bottles! this seems like a really good, high quality product. I love the cute little sleeve. I’d use this every day. i think that it would be nice to have a mug that actually keeps one’s drinks cold or warm. and i also like that they don’t leak. thank you for the giveaway. I’ve never heard of this company before. Would love to try their products. Thanks! Your review is very informative and interesting. I have heard of this company from another blogger once. I love my stainless steel coffee mug. Plastic ones are not worth purchasing. My issue though is not with the hot drinks, but how to pack milk to work (for coffees and cereals), and the water bottles I have has a difficult to use lid. Great products to review! I have never heard of this company before but I know my husband would love the food container one for work. I could send hot foods with him instead of just sandwiches and if he didn’t get a chance to pull his truck over right away it would still be hot later when he does. Thanks for reviewing this and giving me info on these items. Thanks for sharing your experience with these products! Learning that there are so many great features: toxic-free, 18 hours heat capability, no spillage … makes we want to get one (or several) right away. Glad you have introduced me to this company! I think I would like one of the flask with the neoprene cover, but don’t think my husband would love the pink. It would be nice for my water to stay cold longer than a few minutes. Since I’ve had a baby, I’ve been more aware about BPA. i’m glad these products are BPA-free. The pink cover is so pretty! I like how the Insulated Stainless Steel Thermo Cup has a non slip base, can’t tell you how many times that would come in handy! I’m always accidentally knocking something over. I’d love one of their Thermos. It’d be great for hot tea! I love the fact that these are BPA free. The little pink cover in the picture is so cute! love all the items in the post, and a good use for travellers. The flasks look really durable and sturdy. I can take them anywhere. I really like the stainless steel mugs look. I also love that it would keep my coffee warm until I was ready for the next cup at work! Very timely review, I’ve just been looking for a travel mug. I love the pink insulation on the flask!!! This is something I would use all the time and the case is soooo cute! These products are cool. They would help you save money. Oh the travel mug… I want one 🙂 I hate my coffee getting so cold so quick. 7 hours… I wanna give it a go! Not that my coffee will last 7 hours 😉 HA HA! But an hour or two on a long drive would be wonderful! These flasks and cups look very nice. Thanks for the interesting and informative review! These are really nice! Thank you for your review.